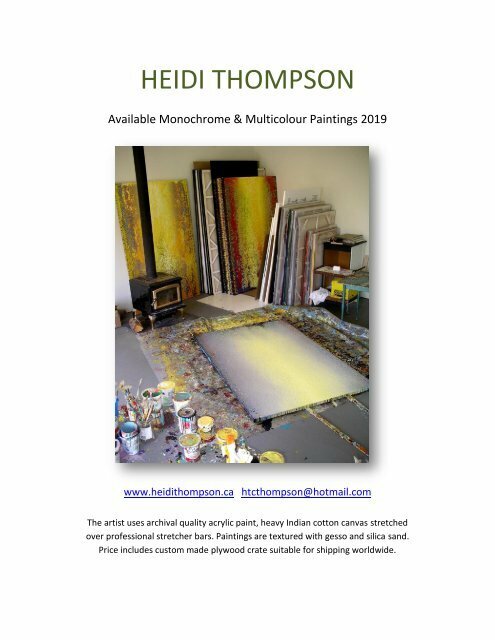 HEIDI THOMPSON Available Monochrome & Multicolour Paintings 2019 www.heidithompson.ca htcthompson@hotmail.com The artist uses archival quality acrylic paint, heavy Indian cotton canvas stretched over professional stretcher bars. Paintings are textured with gesso and silica sand. Price includes custom made plywood crate suitable for shipping worldwide.